French Emblems: Emblem: Invidia integritatis assecla. Envy is a servant to integrity. Rana loquax, stabulantur & hydri. The palm lifts its head high to the heavens: at its foot live the noisy frog and the water-snakes. Outstanding men, whose life accords with what is just, are besieged by the weak, and the envious tongue. ptae visebantur ranae & natrices, hydros vocant. The verse-form is a Heroic hexameter coupled with a Archilochian tetrameter catalectic. In the book which Plutarch wrote on the silent oracles of the Pythoness, he records that in the Oecus of Corinth (a building which was consecrated by the tyrant Cypselus) among the offerings set up in the temple there stood a bronze Palm-tree, in whose roots could be seen carved frogs and the water-snakes they call hydri. In this emblem, albeit it is turned to a different meaning there than the one Diogenes gave it, I judge the meaning to be this: it is noisy wranglers (I happily follow Pliny in using that word of Cato’s, vitilitigator) and the slanderous tongues of the envious, [p.82] armed with deadly poison, that attack the lives of those men, who are raising themselves up to honours and eminence not by crooked means but by right behaviour - unlike Rufinus, Eutropius, and others of that stripe, who strive after wealth and honours with their knavish trickery. All of whose efforts lead to this result, that they overturn and strip away all the good fortune of worthy and innocent men, since the latter, trusting in their own innocence, readily dismiss the barking of the slanderers and the mammoth efforts of the envious. 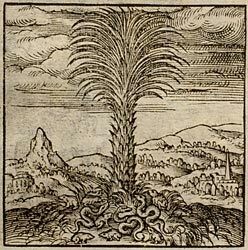 The palm is tall, and the tree is of the first order of nobility, and has overcome serious difficulties, and is never despoiled of its leaves; most aptly does it represent those who are powerful, wealthy and successful. At its roots are shown frogs (everyone knows about their raucous and hideous croaking, which stands unmistakably for the slanderers) and water serpents, the most poisonous of snakes, if we are to believe Pliny; and by them is signified the pestilential hissing of those who are unceasingly envious of other people’s glory. 1. Cornelis Suys, Lord of Rijswijk, President of the Council of Holland. 2. Pythia, the priestess who uttered the oracles of Apollo at Delphi. Plutarch, De Pythiae oraculis, 12 (399F). 3. See Pliny, Natural History, preface, 32. 4. Flavius Rufinus controlled the weak Emperor Arcadius (late 4th century), but was foiled in his plan to make his daughter empress, by another scheming courtier, Eutropius. The latter himself became virtual ruler, till he too was brought down.